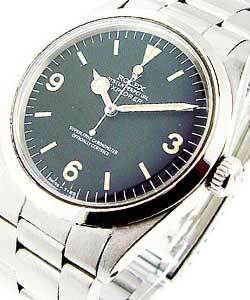 The Rolex Explorer debuted in 1953 on the wrist of Tenzing Norgay, half of the British expedition who reached the summit of Mt. Everest for the first time ever. All variations of the Explorer are made from stainless steel, and measure 36mm and 39mm. Driven by an automatic movement, the Rolex Explorer display only hours, minutes, and seconds on an instantly recognizable black dial featuring Arabic Numerals 3, 6, and 9. The Explorer II models have a fixed bezel that delineates the hours of a second time zone. Boasting of a water-depth rating of 100m and a performance which is second to none, the Rolex Explorer is truly a worthy companion for a once-in-a-lifetime adventure.